Chris and I arrived here in El Salvador 2 days ago and are happily moored in the estuary outside of the Bahia del Sol hotel, which sponsors the Cruisers Rally to El Salvador (and yes, we are participants). There are 20-30 sailboats here participating in the 6 week rally. Rally participants get to use the hotel pool, showers and Wifi for $14 dollars a week, and we booked a mooring bucket for 30 days for $100 bucks. But before we can enjoy the benefits of the El Salvador Rally, first we sailors must earn our keep by "crossing the bar" from the ocean into the estuary. This bar causes pretty righteous waves which normally any sailboat would avoid as if it's life depended on it. But the marina has a professional guide who leads us in and through the waves via jet ski. This is our friends on "Taking Flight" crossing the bar over a particularly harrowing set. For you non-sailors: keep in mind that sailboats and actual breaking waves are never -- EVER -- supposed to be uttered in the same sentence or the same paragraph, even. Finding ourselves low on provisions, this morning we jumped in the dinghy and rode 4 miles through a winding mangrove forest to the little town of La Herredura for the saturday market. ...little baby Maria lies happily on the sidewalk while her young mom peddles her wares nearby. I know, I know...(sigh)...welcome to El Salvador! As opposed to Mexico, which but for the occasional regional uprising has been relatively peaceful for generations, the people of El Salvador have suffered greatly at the hands of military dictators as well as violent revolutionaries. Although the war has been over for years, there is a sense of world weariness in this small country that I simply didn't experience in Mexico. 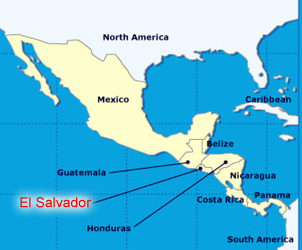 In addition, there is very little tourism here in El Salvador (although that is slowly changing). In fact, their main source of income is remittances (money sent home) from Salvadorian citizens working abroad in the U.S. and other western countries. Interestingly, ultra-frilly (some would say "tacky") aprons are de-riguer for the ladies of La Herradura. Note in this photo above all three women are wearing them. They are apparently worn mostly as fashion, because even women who did not serve food wore them proudly. This sweet lady wore an actual working apron to cover her prized Salvadorian fashion apron. Is this purplexing fashion trend prevalent all over El Salvador, or simply here in La Herradura? Even the town Catholic church wore frilly aprons! Six, to be exact. And on the other side of the main sanctuary, Jesus #2 had an almost gang-like facial tattoo of thorns 'round his head, and lots and lots of mascara. I found him a tad disturbing. ...but then there was this savvy grandma, whom I suspect may know full well the translation of her donated American t-shirt with the words "Compost happens" emblazoned across the front. So here we are in El Salvador! Our plans include visiting San Salvador (the capital) and a trip inland to climb a volcano or two. Mexican coast before Central America. "Hey, Mom! We're driving like 70 MPH! In the back of a truck! Without a seat belt! Or a helmet! And we didnt' even have to sign a permission slip!" The view from our v-berth (sleeping quarters) can't be beat! In other news, during those dark, slightly unsettling hours of our T-peck crossing, we were able to see the Southern Cross at the distant horizon. Yes, it is visible from the lower latitudes of the Northern Hemisphere. She's a beauty! Another new development: we've heard via the sailing grapevine that a much beloved American expat who we all grew to appreciate up in La Cruz was recently seen on "America's Most Wanted" and has since fled the area. 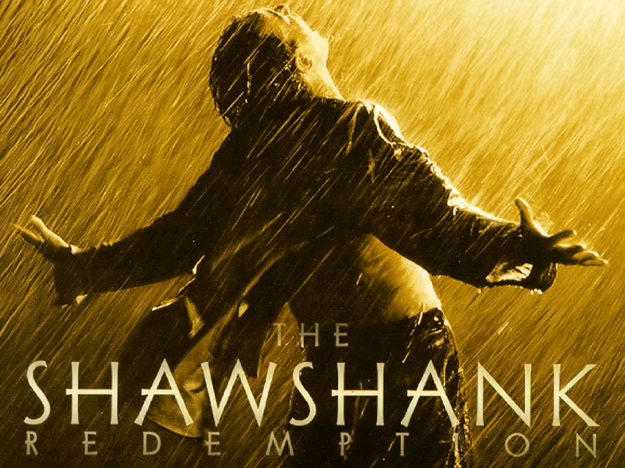 George Clooney and Quentin Tarantino slipped below the border in "Dusk 'til Dawn." "Find us a route to Mexico where we don't have to go through Texas." Thelma, looking at the map: "But Louise, between Arkansas and Mexico, all there IS is Texas!" Louise, yelling: "Trust me, Thelma -- if a woman shoots a man with his pants around his ankles, Texas is not the place you want to get caught!" Well, I got a bit distracted there. But anyway, the point is, if the movies are to believed, Mexico is definitely FILLED with criminals. Could the irony be that the people we should be fearing down here in Mexico are not the Mexicans, but our fellow Americans instead? Well, our plan is to head south from Marina Chiapas tomorrow on 3/27 at daybreak with Jace, Talaria and Stray Cat. 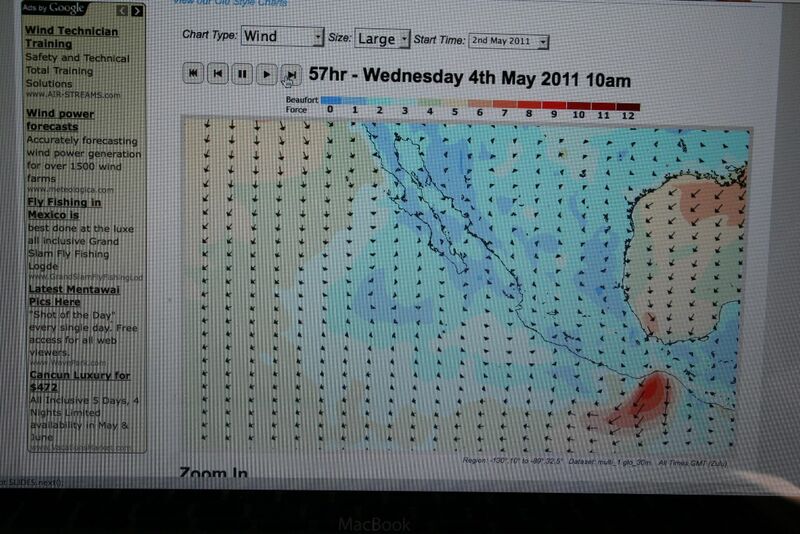 We will bypass Guatemala completely, and should arrive in El Salvador early thursday morning (two nights at sea). As always, we're not sure when we'll get internet in El Salvador so give us a week or more to check in. This wind chart perfectly portrays the horror when the Tehuantapec explodes. Note that there is no wind anywhere else on the map, except the T-pec. The bright red means 70+ knot winds. Fortunately, we and our little armada all crossed the Gulf of Tehuantapec safely, with relatively calm seas. But the thing about "T-peckers" (what they call a Tehuantapec gale, as portrayed above -- aggressive sexual connotation intended, no doubt) is they can come on suddenly, with little warning. And it takes 2-3 days to cross the thing. So even if you have a safe weather prediction, you're never really "safe" until you see the shore on the other side. It's kinda like crossing railroad tracks. You may not see or hear any train coming, but you're not exactly going to sit down and take a nap on the rails. You get the hell over the tracks and heave a sigh of relief. Night number two found us about 2/3rd of the way across the T-pec around midnight, when Chris awoke me from a fitful sleep to announce that our motor failed. There was no wind. There was no moon. Sitting there in the black silence, interrupted only by ominous lightning strikes in the distance, Chris immediately went into master mechanic mode and began methodically taking the motor apart to diagnose the problem. This is Chris at 2AM in the T-pec working on the suddenly failed engine. Note how everything is thrung about in the cabin. 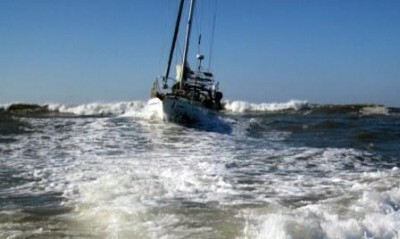 Our boat is usually neat and tidy. But when the engine fails in the middle of the T-pec, there is alot of throwing open hatches, tossing aside stuff looking for parts, etc. Unfortunately at the exact moment when Chris awoke me, I was distressed to find myself with a sudden onslaught of bilateral, purulent conjunctivitis. Gunky, yellowy sludge coated both of my eyes, and my conjunctivae were blood red. Looks like it was our turn in the barrel. I went to the sink and gently cleansed out my eyes with a wet towel as best as I could. I then called the other boats in our group on the VHF, and as the Doolittle family aboard "Jace" was the closest (a few miles away), they stepped up to the plate, changed course and headed in our direction to see what they could do to help. "Talaria" and "Stray Cat" also checked in and monitored the situation with us over the radio. As "Jace" headed our way, Ben and Chris calmly discussed the mechanical puzzle over the radio, and part by part, mechanism by mechanism, different causes for the problem were investigated and ruled out. The cheerful red and green running lights of "Jace" popped from the darkness around 1AM. They quietly motored a wide circle around us as we continued to try to find the problem. Needless to say, simply their presence here in this dangerous, lonely place so far from home was an unspeakable comfort to us. About 3 hours later, the cause was finally found (a broken impeler, for you boat mechanics out there). Fortunately we had a back-up impeler (doesn't EVERYONE? LOL), so Chris replaced it, the motor started and we were on our way. The next morning, I started myself on a regimen of antibiotic eye drops from our medicine chest. "It's just what we do out here. We take care of each other." Especially down here. We're not in Puerta Vallarta anymore. We're 10 miles from the Guatemalan border, where things should really start to get interesting. Mexico has been wonderful. It's a fantastic training ground for the cruising life. It's so comfortable and welcoming that many cruisers never leave Mexico. But not us. It's time for us to head south to Central America. We and a small band of adventurous sailing families are heading south out of Mexico and on to El Salvador. We'll spend a few more days here in Marina Chiapas (they've been wonderful!) resting, provisioning, preparing the boat and checking out of Mexico. We've been anchored in Bahia Santa Cruz in Huatulco for a few days now, preparing to cross the Tuhuanapec. The anchorage here is shallow, comfortable and beautiful. We strongly recommend it! We are waiting for a clear weather window to cross the Gulf of Tuhuanapec into the southernmost region of Mexico. The Isthmus of Tuhuanapec (the red line above) is where wind can accumulate and blow rather fiercely southward from the Carribean, across the small land bridge and into the Pacific. Crossing this area from northwest to the southeast is about 240 miles. We are waiting with several other boats for a good 3 day weather window, at which point we will all jump together to make the passage. Our plan is to leave on Sunday if the weather holds. But if we must wait SOMEWHERE, it is hard to imagine a lovelier place than Huatulco. The lovely center square in Bahia Santa Cruz, Huatulco. These shady tables are Wi-Fi ready! Chris and I walked the two miles to the adjacent town of La Crucecita. The Catholic church there is one of the most beautiful buildings I've ever seen. The walls and ceilings are covered with colorful murals by the artist Jose Angel del Signo. we explored the little town of La Crucecita. After a few anxious days bouncing around in the tiny but very surgy anchorage at Puerto Angel, we pulled anchor and headed south to Huatulco, where we are currently anchored (in a much calmer, safer spot). We will remain in Huatulco for several more days with Talaria, Stray Cat, China Doll and Nana as we wait for the "go" to cross the Tuhuanapec. We will do it together. It's good to have a tribe!